Glass shelters are the best way to provide both protection and a touch of discreet dynamic design for exposed spaces. The transparent, glossy nature of glass, as well as its sturdy, thin profile, does not overload the aesthetic aspect of the space where a glass shelter is installed. The glassboard is supported by a uniform beam of Salinox’s crystal railing bases (depending on the projection distance and glass thickness). For constructions less than 1.2m long, the glassboard does not need additional support with struts. For projections longer than 1.2m, stainless steel struts must be used for additional support to the glassboard. 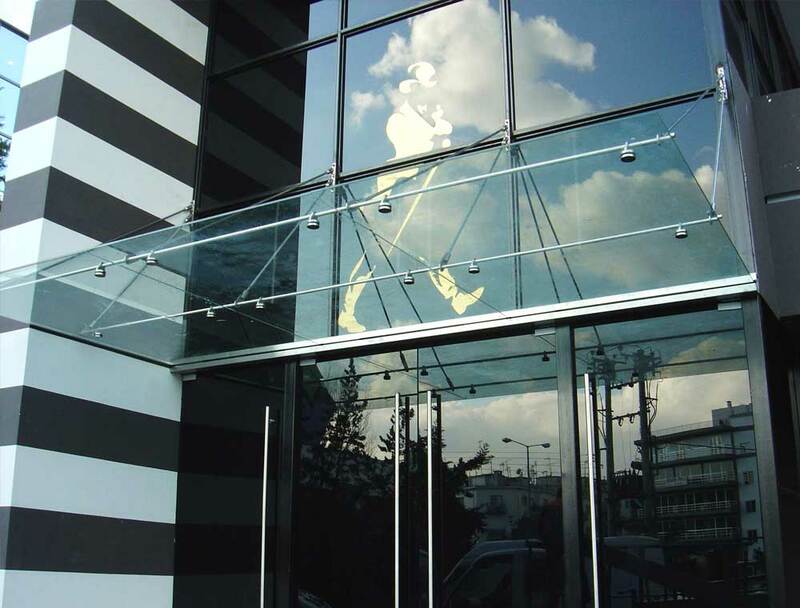 Glass canopies could be an ideal choice for both commercial and residential applications. An impressive spectacle is achieved when an LED tape is positioned inside the mounts, allowing glass to travel through the horizontal dimension of the glass and refract at its edges, while the glassboard’s outter side retains its transparency.